-- Details of the services. Vacuum heat treating services including vacuum hardening for tool, die & stainless steel & vacuum annealing. 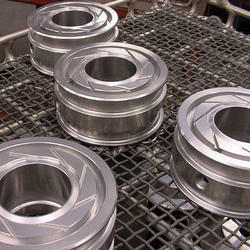 Materials handled include high speed steel, stainless steel & tool steel. Materials in length up to 48 in., width up to 36 in. & height up to 36 in. can be handled. Markets served include extrusion, food processing, injection molding, printing, tool & die, appliance, automotive & military. Vacuum heat treating services for aerospace applications. 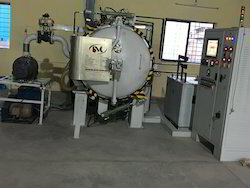 Vacuum heat treating services include nitrogen quenching or hardening, vacuum tempering & annealing, vacuum stress relieving, vacuum solution treatment & vacuum precipitation hardening. Vacuum heat treating consists of thermally treating metals in heated enclosures that are evacuated to partial pressures compatible with the specific metals and processes. 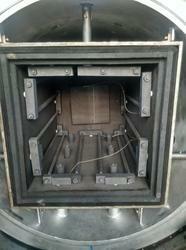 Vacuum is substituted for the more commonly used protective gas atmosphere during part or all of the heat treatment. The vacuum system ensures that parts processed through heat treating cycles are not contaminated by high-temperature reactions and remain free of oxidation and discoloration. As in annealing, brazing, and stress relieving, vacuum metal processing of tooling and high strength steel can give you an advantage over conventional hardening and tempering. Vacuum prevents high temperature oxidation and decarburization, while gas quenching from vacuum minimizes distortion over traditional oil quenching. Vacuum tempering keeps parts bright and clean with no temper scale. Looking for Vacuum Heat Treatment Services ?